Construction of recombinant DNA, in which a foreign DNA fragment is inserted into a plasmid vector. In this example, the gene indicated by the white color is inactivated upon insertion of the foreign DNA fragment. Recombinant DNA (rDNA) molecules are DNA molecules formed by laboratory methods of genetic recombination (such as molecular cloning) to bring together genetic material from multiple sources, creating sequences that would not otherwise be found in the genome. Recombinant DNA is possible because DNA molecules from all organisms share the same chemical structure. They differ only in the nucleotide sequence within that identical overall structure. Recombinant DNA is the general name for a piece of DNA that has been created by the combination of at least two strands. Recombinant DNA molecules are sometimes called chimeric DNA, because they can be made of material from two different species, like the mythical chimera. R-DNA technology uses palindromic sequences and leads to the production of sticky and blunt ends. Proteins that can result from the expression of recombinant DNA within living cells are termed recombinant proteins. When recombinant DNA encoding a protein is introduced into a host organism, the recombinant protein is not necessarily produced. Expression of foreign proteins requires the use of specialized expression vectors and often necessitates significant restructuring by foreign coding sequences. Molecular cloning is the laboratory process used to create recombinant DNA. It is one of two widely used methods, along with polymerase chain reaction (PCR) used to direct the replication of any specific DNA sequence chosen by the experimentalist. There are two fundamental differences between the methods. One is that molecular cloning involves replication of the DNA within a living cell, while PCR replicates DNA in the test tube, free of living cells. The other difference is that cloning involves cutting and pasting DNA sequences, while PCR only copies/amplifies an existing sequence. Formation of recombinant DNA requires a cloning vector, a DNA molecule that replicates within a living cell. Vectors are generally derived from plasmids or viruses, and represent relatively small segments of DNA that contain necessary genetic signals for replication, as well as additional elements for convenience in inserting foreign DNA, identifying cells that contain recombinant DNA, and, where appropriate, expressing the foreign DNA. The choice of vector for molecular cloning depends on the choice of host organism, the size of the DNA to be cloned, and whether and how the foreign DNA is to be expressed. The DNA segments can be combined by using a variety of methods, such as restriction enzyme/ligase cloning or Gibson assembly. In standard cloning protocols, the cloning of any DNA fragment essentially involves seven steps: (1) Choice of host organism and cloning vector, (2) Preparation of vector DNA, (3) Preparation of DNA to be cloned, (4) Creation of recombinant DNA, (5) Introduction of recombinant DNA into the host organism, (6) Selection of organisms containing recombinant DNA, and (7) Screening for clones with desired DNA inserts and biological properties. These steps are described in some detail in a related article (molecular cloning). Following transplantation into the host organism, the foreign DNA contained within the recombinant DNA construct may or may not be expressed. That is, the DNA may simply be replicated without expression, or it may be transcribed and translated at a recombinant protein is produced. Generally speaking, expression of a foreign gene requires restructuring the gene to include sequences that are required for producing an mRNA molecule that can be used by the host's translational apparatus (e.g. promoter, translational initiation signal, and transcriptional terminator). Specific changes to the host organism may be made to improve expression of the ectopic gene. In addition, changes may be needed to the coding sequences as well, to optimize translation, make the protein soluble, direct the recombinant protein to the proper cellular or extracellular location, and stabilize the protein from degradation. In most cases, organisms containing recombinant DNA have apparently normal phenotypes. That is, their appearance, behavior and metabolism are usually unchanged, and the only way to demonstrate the presence of recombinant sequences is to examine the DNA itself, typically using a polymerase chain reaction (PCR) test. Significant exceptions exist, and are discussed below. If the rDNA sequences encode a gene that is expressed, then the presence of RNA and/or protein products of the recombinant gene can be detected, typically using RT-PCR or western hybridization methods. Gross phenotypic changes are not the norm, unless the recombinant gene has been chosen and modified so as to generate biological activity in the host organism. Additional phenotypes that are encountered include toxicity to the host organism induced by the recombinant gene product, especially if it is over-expressed or expressed within inappropriate cells or tissues. In some cases, recombinant DNA can have deleterious effects even if it is not expressed. One mechanism by which this happens is insertional inactivation, in which the rDNA becomes inserted into a host cell's gene. In some cases, researchers use this phenomenon to "knock out" genes to determine their biological function and importance. Another mechanism by which rDNA insertion into chromosomal DNA can affect gene expression is by inappropriate activation of previously unexpressed host cell genes. This can happen, for example, when a recombinant DNA fragment containing an active promoter becomes located next to a previously silent host cell gene, or when a host cell gene that functions to restrain gene expression undergoes insertional inactivation by recombinant DNA. Recombinant DNA is widely used in biotechnology, medicine and research. Today, recombinant proteins and other products that result from the use of DNA technology are found in essentially every western pharmacy, doctor's or veterinarian's office, medical testing laboratory, and biological research laboratory. 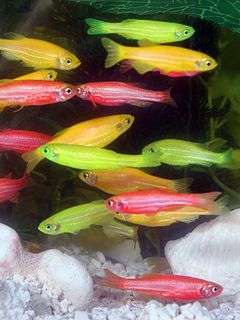 In addition, organisms that have been manipulated using recombinant DNA technology, as well as products derived from those organisms, have found their way into many farms, supermarkets, home medicine cabinets, and even pet shops, such as those that sell GloFish and other genetically modified animals. The most common application of recombinant DNA is in basic research, in which the technology is important to most current work in the biological and biomedical sciences. Recombinant DNA is used to identify, map and sequence genes, and to determine their function. rDNA probes are employed in analyzing gene expression within individual cells, and throughout the tissues of whole organisms. Recombinant proteins are widely used as reagents in laboratory experiments and to generate antibody probes for examining protein synthesis within cells and organisms. Many additional practical applications of recombinant DNA are found in industry, food production, human and veterinary medicine, agriculture, and bioengineering. Some specific examples are identified below. Found in rennet, chymosin is an enzyme required to manufacture cheese. It was the first genetically engineered food additive used commercially. Traditionally, processors obtained chymosin from rennet, a preparation derived from the fourth stomach of milk-fed calves. Scientists engineered a non-pathogenic strain (K-12) of E. coli bacteria for large-scale laboratory production of the enzyme. This microbiologically produced recombinant enzyme, identical structurally to the calf derived enzyme, costs less and is produced in abundant quantities. Today about 60% of U.S. hard cheese is made with genetically engineered chymosin. In 1990, FDA granted chymosin "generally recognized as safe" (GRAS) status based on data showing that the enzyme was safe. Almost completely replaced insulin obtained from animal sources (e.g. pigs and cattle) for the treatment of insulin-dependent diabetes. A variety of different recombinant insulin preparations are in widespread use. Recombinant insulin is synthesized by inserting the human insulin gene into E. coli, or yeast (saccharomyces cerevisiae) which then produces insulin for human use. A recombinant variety of rice that has been engineered to express the enzymes responsible for β-carotene biosynthesis. This variety of rice holds substantial promise for reducing the incidence of vitamin A deficiency in the world's population. Golden rice is not currently in use, pending the resolution of regulatory and intellectual property issues. Commercial varieties of important agricultural crops (including soy, maize/corn, sorghum, canola, alfalfa and cotton) have been developed that incorporate a recombinant gene that results in resistance to the herbicide glyphosate (trade name Roundup), and simplifies weed control by glyphosate application. These crops are in common commercial use in several countries. Bacillus thuringeiensis is a bacterium that naturally produces a protein (Bt toxin) with insecticidal properties. The bacterium has been applied to crops as an insect-control strategy for many years, and this practice has been widely adopted in agriculture and gardening. Recently, plants have been developed that express a recombinant form of the bacterial protein, which may effectively control some insect predators. Environmental issues associated with the use of these transgenic crops have not been fully resolved. The idea of recombinant DNA was first proposed by Peter Lobban, a graduate student of Prof. Dale Kaiser in the Biochemistry Department at Stanford University Medical School. The first publications describing the successful production and intracellular replication of recombinant DNA appeared in 1972 and 1973. Stanford University applied for a US patent on recombinant DNA in 1974, listing the inventors as Stanley N. Cohen and Herbert W. Boyer; this patent was awarded in 1980. The first licensed drug generated using recombinant DNA technology was human insulin, developed by Genentech and Licensed by Eli Lilly and Company. Scientists associated with the initial development of recombinant DNA methods recognized that the potential existed for organisms containing recombinant DNA to have undesirable or dangerous properties. At the 1975 Asilomar Conference on Recombinant DNA, these concerns were discussed and a voluntary moratorium on recombinant DNA research was initiated for experiments that were considered particularly risky. This moratorium was widely observed until the National Institutes of Health (USA) developed and issued formal guidelines for rDNA work. Today, recombinant DNA molecules and recombinant proteins are usually not regarded as dangerous. However, concerns remain about some organisms that express recombinant DNA, particularly when they leave the laboratory and are introduced into the environment or food chain. These concerns are discussed in the articles on genetically modified organisms and genetically modified food controversies. ↑ Campbell, Neil A. & Reece, Jane B.. (2002). Biology (6th ed.). San Francisco: Addison Wesley. pp. 375–401. ISBN 0-201-75054-6. 1 2 Watson, James D. (2007). Recombinant DNA: Genes and Genomes: A Short Course. San Francisco: W.H. Freeman. ISBN 0-7167-2866-4. ↑ Hannig, G.; Makrides, S. (1998). "Strategies for optimizing heterologous protein expression in Escherichia coli". Trends in Biotechnology. 16 (2): 54–60. doi:10.1016/S0167-7799(97)01155-4. PMID 9487731. ↑ Brondyk, W. H. (2009). "Chapter 11 Selecting an Appropriate Method for Expressing a Recombinant Protein". Methods in enzymology. Methods in Enzymology. 463: 131–147. doi:10.1016/S0076-6879(09)63011-1. ISBN 9780123745361. PMID 19892171. 1 2 3 Brown, Terry (2006). Gene Cloning and DNA Analysis: an Introduction. Cambridge, MA: Blackwell Pub. ISBN 1-4051-1121-6. 1 2 Ye, X.; Al-Babili, S.; Klöti, A.; Zhang, J.; Lucca, P.; Beyer, P.; Potrykus, I. (2000). "Engineering the provitamin A (beta-carotene) biosynthetic pathway into (carotenoid-free) rice endosperm". Science. 287 (5451): 303–305. doi:10.1126/science.287.5451.303. PMID 10634784. ↑ Koller, B. H.; Smithies, O. (1992). "Altering Genes in Animals by Gene Targeting". Annual Review of Immunology. 10: 705–730. doi:10.1146/annurev.iy.10.040192.003421. PMID 1591000. ↑ Gualandi-Signorini, A.; Giorgi, G. (2001). "Insulin formulations--a review". European review for medical and pharmacological sciences. 5 (3): 73–83. PMID 12004916. ↑ Von Fange, T.; McDiarmid, T.; MacKler, L.; Zolotor, A. (2008). "Clinical inquiries: Can recombinant growth hormone effectively treat idiopathic short stature?". The Journal of family practice. 57 (9): 611–612. PMID 18786336. ↑ Fernandez, M.; Hosey, R. (2009). "Performance-enhancing drugs snare nonathletes, too". The Journal of family practice. 58 (1): 16–23. PMID 19141266. ↑ Manco-Johnson, M. J. (2010). "Advances in the Care and Treatment of Children with Hemophilia". Advances in Pediatrics. 57 (1): 287–294. doi:10.1016/j.yapd.2010.08.007. PMID 21056743. 1 2 Paine, J. A.; Shipton, C. A.; Chaggar, S.; Howells, R. M.; Kennedy, M. J.; Vernon, G.; Wright, S. Y.; Hinchliffe, E.; Adams, J. L.; Silverstone, A. L.; Drake, R. (2005). "Improving the nutritional value of Golden Rice through increased pro-vitamin a content". Nature Biotechnology. 23 (4): 482–487. doi:10.1038/nbt1082. PMID 15793573. ↑ Funke, T.; Han, H.; Healy-Fried, M.; Fischer, M.; Schönbrunn, E. (2006). "Molecular basis for the herbicide resistance of Roundup Ready crops". Proceedings of the National Academy of Sciences. 103 (35): 13010–13015. doi:10.1073/pnas.0603638103. PMC 1559744 . PMID 16916934. ↑ Mendelsohn, M.; Kough, J.; Vaituzis, Z.; Matthews, K. (2003). "Are Bt crops safe?". Nature Biotechnology. 21 (9): 1003–1009. doi:10.1038/nbt0903-1003. PMID 12949561. ↑ Lear, J. (1978). Recombinant DNA: The Untold Story. New York: Crown Publishers. p. 43. ↑ Jackson, D.; Symons, R.; Berg, P. (1972). "Biochemical method for inserting new genetic information into DNA of Simian Virus 40: Circular SV40 DNA molecules containing lambda phage genes and the galactose operon of Escherichia coli". Proceedings of the National Academy of Sciences of the United States of America. 69 (10): 2904–2909. doi:10.1073/pnas.69.10.2904. PMC 389671 . PMID 4342968. ↑ Mertz, J. E.; Davis, R. W. (1972). "Cleavage of DNA by R 1 restriction endonuclease generates cohesive ends". Proceedings of the National Academy of Sciences of the United States of America. 69 (11): 3370–4. doi:10.1073/pnas.69.11.3370. PMC 389773 . PMID 4343968. ↑ Lobban, P.; Kaiser, A. (1973). "Enzymatic end-to end joining of DNA molecules". Journal of Molecular Biology. 78 (3): 453–471. doi:10.1016/0022-2836(73)90468-3. PMID 4754844. ↑ Hughes, S. (2001). "Making dollars out of DNA. The first major patent in biotechnology and the commercialization of molecular biology, 1974-1980". Isis; an international review devoted to the history of science and its cultural influences. 92 (3): 541–575. doi:10.1086/385281. PMID 11810894. ↑ Johnson, I. S. (1983). "Human insulin from recombinant DNA technology". Science. 219 (4585): 632–637. doi:10.1126/science.6337396. PMID 6337396. Micklas, David. 2003. DNA Science: A First Course. Cold Spring Harbor Press: ISBN 978-0-87969-636-8. Rasmussen, Nicolas, Gene Jockeys: Life Science and the rise of Biotech Enterprise, Johns Hopkins University Press, (Baltimore), 2014. ISBN 978-1-42141-340-2. Rosenfeld, Israel. 2010. DNA: A Graphic Guide to the Molecule that Shook the World. Columbia University Press: ISBN 978-0-231-14271-7. Watson, James. 2004. DNA: The Secret of Life. Random House: ISBN 978-0-09-945184-6. Recombinant DNA research at UCSF and commercial application at Genentech Edited transcript of 1994 interview with Herbert W. Boyer, Living history project. Oral history.